By adding a pergola to your yard, you can create a cool, shaded space to spend time with loved ones while you enjoy the outdoors. If you are in the Minneapolis, Minnesota, area, and want a top-of-the-line pergola, look no further than U.S. Patio Systems and Home Remodeling. Our experienced team can help you find the perfect shade solution for your outdoor living area and can expertly install your new home addition. When you turn to U.S. Patio Systems and Home Remodeling, you can be certain that you are receiving an aesthetically pleasing and long-lasting pergola for your property in the Minneapolis, MN, area. All of our pergolas come with an electrostatic finish that makes them exceptionally easy to clean and resistant to damage. Plus, we have a number of different styles to choose from, so you are sure to find a design you’ll love. 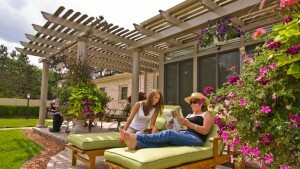 If you would like to learn more about adding a pergola to your outdoor living space in the Minneapolis, MN, area, contact U.S. Patio Systems and Home Remodeling today. Our specialists will gladly answer any questions you have and can tell you more about all of the outstanding products and services we have available.